This article depicts some high points of Grand Maestro Oleg Maltsev’s lecture on one of the world fencing schools, particularly an Italian one. Italian school of fencing has been famous in the field of fencing since long, the main source of particular lecture in regard to which this piece is being written is Eagerton Castle’s work called “Schools and masters of Fence: From the Middle Ages to the Eighteenth Century”. We will raise unique topics referring to a new field of research and a whole historical layer, which no one has ever dared to start research on. The discourse is going to be about the study of Italian fencing in terms of documents that were carried over and still exist, as well as the opinions of the authors of treatises authors of the Middle Ages. In the previous article, we have divided Italy into three parts: central, northern and southern. We have identified a number of factors that influenced the formation of Italian fencing. Needless to say, there will be indignation of certain people whose disposition will be affected by the exquisite Italian fencing. However, after all we are interested in the truth; hence we are going to rely on documents solely. One has to learn to face the truth. Offence does not make sense as it is difficult to argue with the fact that all current knowledge of people engaged in Italian fencing are things that they have been taught, or merely, their opinion on that aspect. Let us start with the book called “Schools and masters of fencing: From the Middle Ages to the Eighteenth Century”. The edition which is being looked at is Oxford library press, written in Great Britain, 1885. After one studies it, it is going to be possible to get to the core of what people thought about Italian fencing in the nineteenth century. Furthermore, we will look at some other documents that are genuine rarities of Italian culture, published in Venice and Bologna, although, it has to be pointed out that at that time period these territories were not part of Italy. We are going to proceed by means of arbitrary history line, the end point of which is the 20th century; manual states that by the XVIII century Italian fencing was completely superseded by French fencing. On the territory of present day Italy remained only the French and Neapolitan fencing schools, as described in the introduction (see pages 1, 2). As a result, French standard emerged that has been in effect for many years. Coming back to the period of the 12th-13th centuries, it is obvious that there is a great deal of confusion about this part of the history for the reason of existing documents of the XI-XIII centuries are very doubtful. Scientists try not to rely on these documents, believing that these documents were created artificially at a later time in order to justify the existence of certain fencing schools in Italy. This is going to be discourse in more detail upon further research. Furthermore, according to this fencing manual the Italian fencing begins with a fencing treatise of the XV-XVI centuries written by Achille Marozzo. There is also work of Antonio Mancholino of that period. In terms of fencing techniques it is scarce, but provides the concept of an old Italian fencing school. Marozzo was Bolognese, but at the same time he lived in Venice, so it is hard to identify whether he is a Venetian or a Bolognese swordsman. However, the vast majority of Italian works were printed in Venice in the Middle Ages. By taking a look of what Everton Castle the author of the manual had written on old fencing school that existed in the earlier period, we can point out that fencing was rough and undisciplined, built on aggression and search of an inspiration. The skills of these people were scarce as they possessed knowledge of only a limited number of elements. Marozzo left behind his “fencing tree”, description of it can be found in some of his works. The first “tree” is about fighting positions, the second one is about striking and parrying; the second “tree” is the main one. All in all, in Europe, particularly in Italy, it is commonly believed that the beginning of Italian fencing was laid by Marozzo and Mancolino in the 15th century. Going further, by conducting such an investigation, we may look along Marozzo “old guard” of fencing masters. First maestro that could stand next to Marozzo is Giacomo di Grassi. His first Venetian treatise is considered to be an exceptional one. The second maestro, who can take a worthy place next to Marozzo and di Grassi is Camillo Agrippa. His “Treatise on the Science of Arms with Philosophical Dialogue” was published in 1553. Later we will return to these works and analyze them separately. It is important to understand that these people set the “tone” of Italian fencing. Talking about the Giacomo di Grassi work it is obvious that it is purely Venetian fencing treatise. Only Venetian person could have written this kind of a book, since it is entirely based on scientific foundation which is complete opposite to work of Marozzo. This is a powerful book for intelligent people. As for the work of Marozzo, it is meant for majority of people as it contains little information about the fencing itself. Agrippa’s treatise is highly informative one. It is believed that the author is also Venetian, although there is much debate about it, since the treatise was published in Venice, Rome, and in other countries as well. Salvator Fabrice is the next author that we see in the fencing manual. He is Venetian man who studied in Spain, France and Germany. 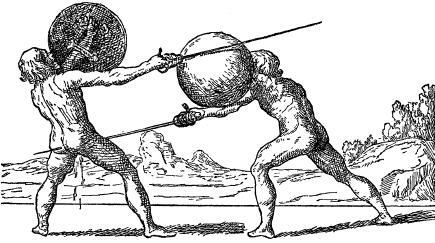 His treatise “De Lo Schermo overo Scienza d’Arme” in 1606 predetermined the appearance of Italian fencing. The book created sensation in Italy and other countries of the world. Another interesting figure is Francesco Alfieri, his treatise “The Art of Good Possession of Rapier” in 1653 also predetermined the appearance of current (in those days) Italian fencing. In fact, these two books are personifications of Italian fencing and revelation of its scientific understanding. They contain all secrets and differences of Italian fencing from others. As far as you can see, both of them are Venetian and written in Padua. It should be noted that at certain time this city in Italy was headed by the world-famous commander Erasmo da Narni – the ruler of Padua, who was the son of a baker, but eventually became the ruler of the city. There is also a treatise of Capo Ferro. It is believed that this treatise also deserves attention. However, there is nothing specific about it, although it contains a description of some of the fencing advantages, the length of the sword, etc. The next work which we will talk about is a treatise of 1606 “Scola, overo, teatro”, written by Venetian Nicoletto Giganti. He cleared Italian fencing from excessive wisdom and made 14 technical elements, which later formed the basis of Italian fencing. In fact, knowledge of these basic elements is quite enough for people, the rest is intended for masters. Blengini writes that “all these fencing schools are good, but the Neapolitan school is the best.” He refers to specific authoritative sources. He gives an example, no matter how foreigners desired to destroy the Neapolitan fencing school, it still survived. This is the only one remaining school in Italy, which is confirmed by this manual. However, the French standard has spread throughout Italy. With this paragraph we conclude a brief overview of all schools of fencing and the history of Italian fencing, which should give an initial idea of ​​how one could approach the study. On further study one may talk about the technical characteristics of Italian fencing and compare it with other schools, understand why this technique is used, talk about speculation and solve puzzles of this type of martial art. To verify the information yourself readers can always refer to the manual where further details along the article can be found. Finally, it would be useful to pay attention to the book “Attestation of the masters of fencing” by don Luis Pacheco de Narvaez. If one considers himself a master of Spanish fencing, he should know that this short treatise clarifies how master is to be certified to teach Destreza, otherwise, according to don Luis Pacheco de Narvaez one cannot be considered to be a master of Spanish fencing not meeting the requirements of the book.